One of Brazil's top airlines, Gol, has agreed to pay $1.3m (£1m) to an indigenous tribe in compensation for the damage caused by a 2006 plane crash. A Gol aircraft on a commercial flight collided with a private jet in mid-air in September 2006, in the skies above the Caiapó indigenous reserve. The Caiapó tribe refused to go back to the area where the debris fell. They say it is now polluted and cursed with the presence of the dead. Their dwellings and a health centre set up by Brazil's indigenous agency, Funai, had to be rebuilt elsewhere in the reserve, a Caiapó chief told Globo television. 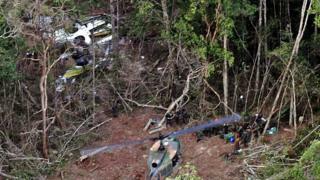 The two planes were travelling in opposite directions when they collided over an area of the Amazon forest in the state of Mato Grosso. The Embraer Legacy 600 private jet, which was travelling to the United States, managed to fly to a nearby airport and land safely. But the Gol Boeing 737-8EH aircraft crashed in the middle of the reserve, killing all 154 people onboard. A Brazilian government inquiry concluded that there had been errors both by the two American pilots on the Legacy jet and air traffic control in Brazil. Two years ago, tribe leaders sought help from Funai to ask for compensation, Globo TV reported. The airline and tribe leaders came to an out-of-court agreement, which was signed by the Caiapó at a ceremony earlier this month. The Caiapó chief is Raoni Metuktire, who became famous when he travelled around the world with British rock star Sting in the late 1980s to highlight the destruction of the Amazon rainforest. He campaigned for the demarcation of indigenous lands, threatened by hydroelectric dams, illegal mining and the expansion of soya plantations. His foundation will manage the compensation money, under the watch of Funai and Brazil's Attorney General's Office.